Plugs are very versatile and productive lures. They catch a wide variety of species and are effective in many angling situations. As a full time guide, I really enjoy plug fishing Sarasota on my fishing charters. A detailed article on the subject follows my weekly Sarasota fishing report. 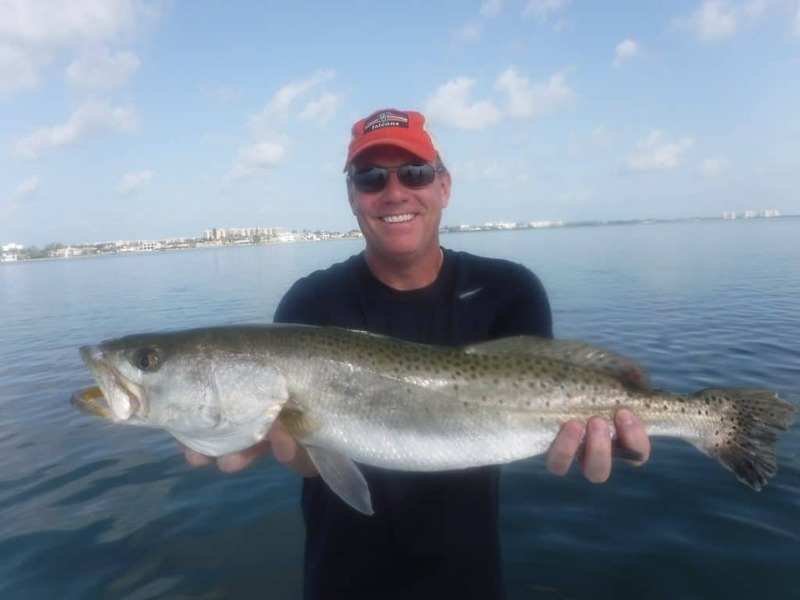 Weather was an issue for clients on Sarasota fishing charters this week. The wind switched to the southwest, which brings morning storms instead of the normal afternoon rains. I did not get out until Wednesday, to find conditions a bit challenging. The water was a bit stirred up and murky. This makes bait harder to find. Still, persistent anglers did well on a variety of species. The deep grass flats at the Radio Tower, Middlegrounds, Country Club Shores, and Bishop’s Pt. were productive this week. Speckled trout to 24″, bluefish, Spanish mackerel, sea bass, snapper, gag grouper, ladyfish, jack crevelle, and catfish were landed. Gulp Shrimp and Bass Assassin Sea Shad baits on a 1/4 ounce jig head were productive. Though bait was small and a bit tough to get, chumming was effective later in the morning. The wind let up and switched to the southeast on Friday. What a difference that made! We started off in Big Sarasota Pass, catching several small snook and nice mangrove snapper free lining large live shrimp. Bait was much easier, and I filled up the well. We snook fished a bit more with no success. A switch to the deep flats was a good decision. The guys landed a bunch of trout along with other species. Jessica made a perfect cast placing her plug right next to the dock piling on the up current side. A sharp twitch of her rod to caused the Rapala to dive a couple of feet below the surface and dart seductively. On the third pause, the lure just stopped and a nice redfish boiled on the surface, furious at the hook stuck in its lower jaw. Several minutes and a half dozen head-shaking runs later, the slot size red came alongside, posed for a quick picture, and was released back into the water to contemplate its recent adventure. Two hours of afternoon plug casting resulted in this red small snook, several Jack crevelle and ladyfish. I love fishing, but I really love plug fishing! The reason? Plugs are very productive on a wide variety of species and are a blast to use. Casting is half the fun, making accurate casts under mangrove trees or near docks is very satisfying and challenging. Bites range from subtle takes to downright ferocious strikes. Anglers need to take care, however. Anytime a lure with multiple treble hooks in involved, extra caution is required. Plugs come in many colors, shapes, and sizes, but can be broken down into two categories: surface or top water plugs and sub-surface baits. Top water plugs come in two styles; poppers and walk the dog baits. Poppers are very easy to fish and are quite effective. The Rapala Skitter Pop, Rebel Pop R, and Chug Bug are three popular examples. These are floating baits that have a concave face. The technique is simple; cast it out, let it settle for a moment, then twitch the rod tip sharply causing the face of the plug to dig into the water and make a loud “pop”. The famous Zara Spook is the best-known example of a walk the dog. The Rapala Skitterwalk and MirrOlure Top Dogs are also local favorites. The retrieve is a bit more difficult to master. After being cast out, the rod tip is held down near the water and a rhythmic twitching retrieve causes the lure to dance back and forth on the surface. One common mistake anglers make plug fishing Sarasota is working top water baits to quickly and aggressively. This is particularly true on a very calm day. Slow, subtle action will generally draw more strikes. Another mistake often made is striking too soon. The sight of a large predator blowing up on the top water plug is very exciting, often resulting in a reflex strike that pulls the lure out of the fishes mouth. Instead, wait until the weight of the fish is felt and set the hook in a smooth, sideways manner. This is safer as well. While a top water strike can be spectacular, more fish are caught on subsurface baits. Most of these lures float on the surface and dive down when retrieved Primarily, the lip on the lure determines the depth the plug will run. However, line size and speed are also factors. Lure manufacturers will have the pertinent information on the box. Rapala X-Raps are my personal favorites. Plugs are available in a wide variety of colors and sizes. Generally speaking lures that dive down to to 5 feet are the most effective in our local waters. Match the size of the plug to the available forage. Olive is my favorite all-around color, but gold and black and chartreuse work great in stained water, and pearl and silver are very effective in clear water. Suspending plug such as the venerable MirrOlure can be deadly, particularly on speckled trout. They sink slowly and are worked back with a twitch and pause retrieve. That pause, where the bait just suspends, seemingly helpless, really triggers the strikes. Lipless crank baits, such as the Rattletrap are very easy to use. Just cast it out and reel it back in; they have a great built in action. Chrome with a blue back is the favorite color when plug fishing Sarasota. I use the same basic rod and reel combos for most of my inshore fishing. Spinning reels matched to 6 1/2 to 7 foot rods with either 10 pound monofilament or 20 pound braided work well. I like the monofilament in open water in the braided line when fishing around structure. A 24 inch to 30 inch piece of fluorocarbon leader is attached to the end of the running line. 30 pounds is a good starting test for leader, though you may need to bump it up when fishing for big snook or toothy mackerel. Plugs are versatile; just about every game fish that inhabits the Suncoast will devour them. In addition to casting to structure for snook, redfish, jacks, and other species, plugs are deadly when fished over the grass flats. On a recent charter I had a pair of 11-year-old boys score on a bunch of Spanish mackerel using a number eight Olive X Rap. The boys cast into thick bait schools near Big Pass and burned the baits back as fast as they could turn the real handle. Needless to say, the strikes were explosive! Plugs also catch a lot of speckled trout, oftentimes fooling larger than average sized fish. Top water baits are an excellent choice for fishing very shallow water early and then late in the day. In the summer, shallow bars on the edge of grass flats load up with bait, which in turn attracts game fish. Add in a high tide at first light and the result is an excellent situation to catch a nice fish on top water. Suspending plugs such as the MirrOlure are deadly on speckled trout when fished over the deeper grass, in 4 to 8 feet of water. They also fool mackerel, bluefish, jacks, and other species. These baits do not have a lip, therefore they do not dive. Instead they are cast out and allowed to sink for several seconds, then twitched sharply. The lure just hangs there motionless, helpless, inducing a fish to strike it. Trolling plugs is a great technique to locate fish when scattered about in a large area. This also works well with children and novice anglers; if they can hold rod they can catch a fish. This applies to the inshore bays, passes, and Gulf of Mexico. That number eight Olive saltwater X rap is my go to lure for trolling. Simply let out half the line, close the bail, and drive the boat around just above idle speed. Sometimes working the rod tip will elicit more strikes. One trick that served me well on charters when plug fishing Sarasota is to troll the passes. The traditional method is to drift with the current and cast jigs plugs or spoons. Once the drift is complete the boat idles back up and drift is repeated. As you idle back to the start, why not drag plug behind? Many mornings I catch more Spanish mackerel this way, as they prefer a fast-moving bait. Casting and trolling plugs in the inshore Gulf of Mexico is an extremely effective technique in the spring and again in the fall when pelagic species move through. A large Yozuri 3-D will produce some very nice king mackerel and large Spanish mackerel. Look for birds and bait schools on the surface and troll around the edges of the bait, not right through the middle. 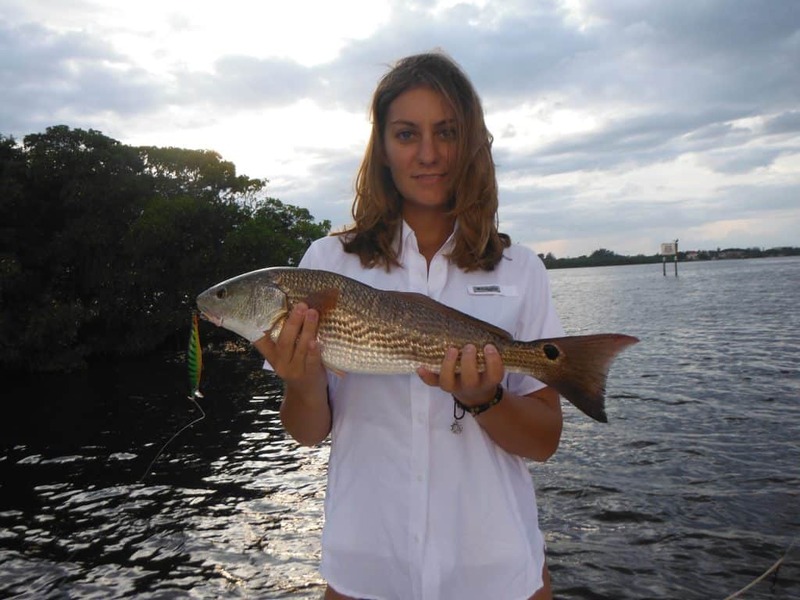 The inshore reefs off of Lido Key hold a lot of fish and are very reliable producers. Sight casting to breaking fish is terrific sport! Spanish mackerel and false albacore will often be seen tearing up schools of helpless baitfish on the surface. Spanish will stay on top longer and not move as much is the false albacore. The Albies can also be very fussy; you need to scale down the offering and go lighter on the leader. With either species, ease the boat into position and cast into the fish or troll around the edge of them and be prepared to hear your drag scream! 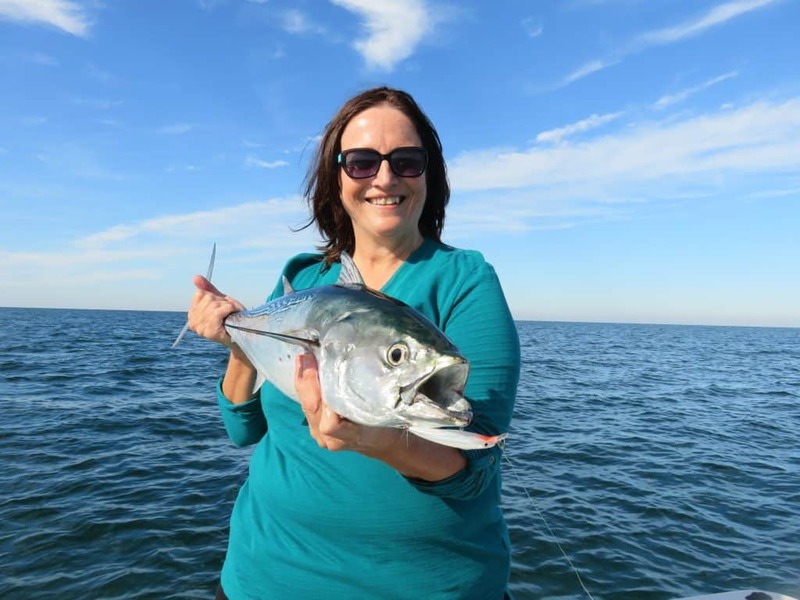 Anglers can also employ the same tactics from the beach to catch Spanish mackerel. In the cooler months snook migrate into creeks canals and rivers. The Phillippi Creek, Bowley’s Creek, Hudson Bayou, and area residential canals on Siesta Key all hold fish. The Manatee, Braden, and Myakka Rivers are all productive winter spots. The fish are scattered and plugs allow an angler to cover a lot of water effectively and thoroughly. Black and gold is an excellent color combination in the tannin stained water, as are bright patterns such as fire tiger. If you venture far enough upstream, don’t be surprised if a nice largemouth bass intercepts your offering meant for a snook. River fishing is a charter that is best for more experienced anglers. This is more of a “quality over quantity” trip. Some trips come up empty, though not very often. 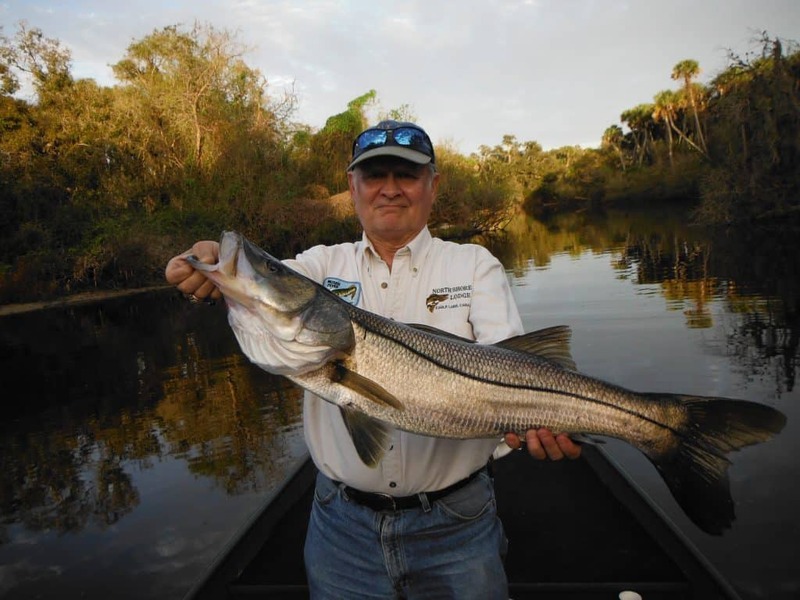 But, there is a chance to land a trophy snook on every river fishing charter. Along with the large snook, average sized fish in the 18″ to 24′ range are commonly caught. Largemouth bass, jack crevelle, are also available and are a fun by-catch! Outside bends in the river are prime spots to hold snook. The deeper holes in the rivers will be found on the bends. The current carves out a deep hole in these spots. If cover such as fallen trees exists, that even improves the chances of catching a nice snook! Tides are crucial as well. Outgoing tides are preferred. If these tides occur early or late in the day, better yet. The ideal river fishing conditions would be as flows. A high, outgoing tide first thing in the morning with cloud cover and even some light rain falling. While saltwater fishing gets the majority of the attention in Sarasota, there are freshwater opportunities as well. Myakka River State Park has upper Myakka Lake in the river flowing through it. Both offer opportunities to catch bass Bram crop he and other species using plugs very small number for Apple is working very well cast towards lily pads and other shoreline vegetation. Lake Manatee is another local productive freshwater lake. It is quite a bit larger and deeper and offers excellent trolling for crappy in the fall and early winter. The Manatee River flows from the dam towards Tampa Bay it has a good population of largemouth bass sunshine bass a local hybrid and snook as well.